Valpo Studio : Eat your cookies, or two, for half the guilt. I'm in. 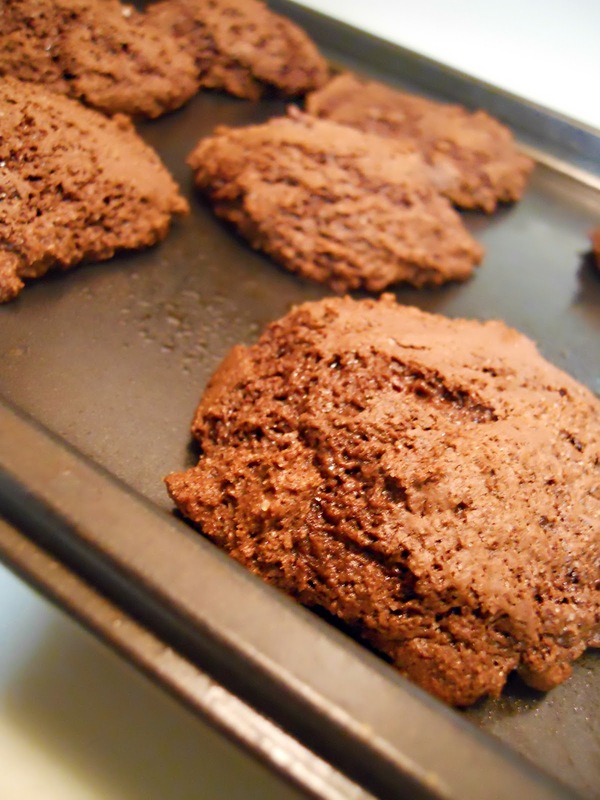 Eat your cookies, or two, for half the guilt. I'm in. 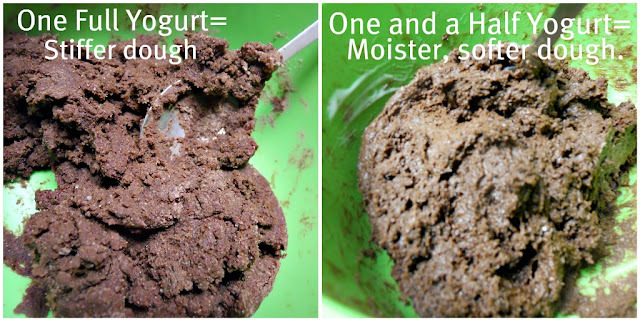 In regards to such event, I'd like to share with you one of the easiest (and if I do say so, yummiest) cookie recipes ever. Serrrriously. 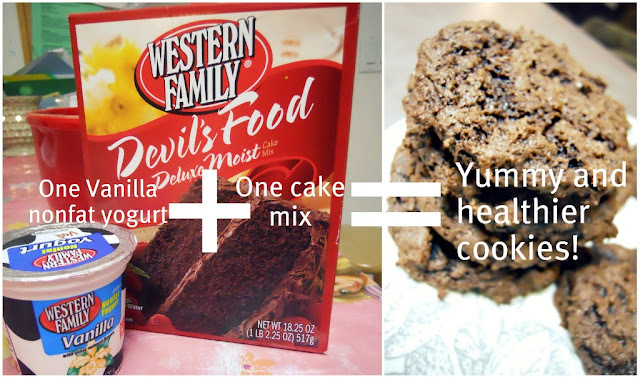 They are FAST: Baked for 8-10 min at 375 degrees F.
EASY: One cake mix (I like the chocolate fudgy ones) and one low or non-fat vanilla yogurt (I usually use Yoplait, but because I'm a cheap college student, pictured below are the knock-off store brands) and that. is. it. people. They are CHEAP: Because obviously there's only 2 ingredients and they both cost less than a dolla. And DELICIOUS: They get crisp on the outside and yummy, fudgy, chewy, gooeyness on the inside. Need I say more? and they are HEALTHY(ish): ok, I wouldn't consider them totally healthy, but the yogurt is the healthy substitute for the oils and eggs that cake box cookies usually call for. When it comes to the dough consistency, it can go one of two ways and varies with the type of cake mix used, but all are good. I prefer the stickier moist dough, which makes them much softer and chewier. Feast your eyes (and your bellies), and follow my example by ALWAYS having a cake mix and yogurt on hand for those last minute -I-gotta-get-a-cookie-in-my-mouth-before-my-woman-stomach-eats-itself, or old-lady-at-church-fell-down-the-stairs-and-needs-a-hospital-visitor- scenario's that we all find ourselves in. These are great. 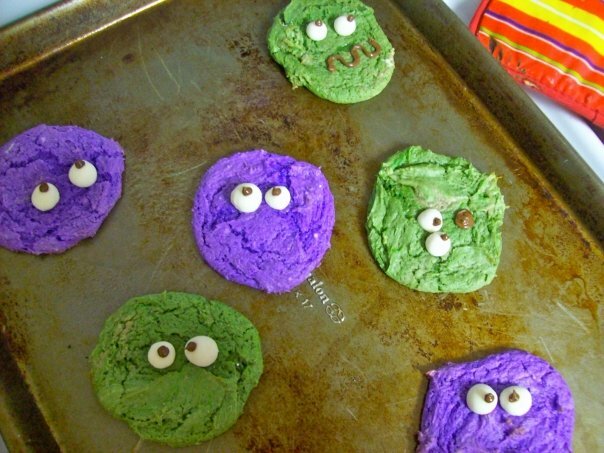 Once I even used white cake mix with food coloring, added marshmallow fondant eyes and made monster cookies for Halloween. They were a hit. Tell yourself they are so healthy you can eat twice as much. 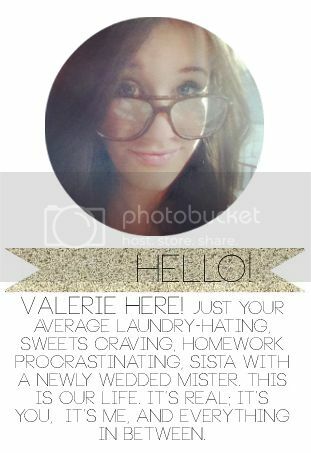 SO glad I found your sweet blog! So cute!!!! And they look absolutely delicious. My apartment is known for all of the delicious treats lying around. They're cute AND tasty? Perfection. this is a great idea, i will be trying them! Calling all prayers! You are SOOO needed. I whip my hurr back and forth. Every conversation leads to the bathroom. "It will all work out."